It's the festive season in sunny Australia at the moment. Summer arrived last week, bringing with it very warm weather, hot enough in my opinion to make fresh citrus iced tea. Byron mowed our front lawn this afternoon and now he's resting inside after a cool shower with a glass of the chilled sweet tea. Hurrah! We have a lawn and a seaside garden filled with palm trees, seashells and large white pebbles from our afternoon strolls along the beach. There are a few succulents, a lavender bush, a frangipani tree and now thanks to my recently acquired green thumb, a vegetable garden that will hopefully flourish with rosemary, basil, cherry tomatoes and avocados. Place tea bags in a saucepan with the water and sugar, bring to the boil and boil for five minutes. Remove the tea bags from the hot tea and squeeze to drain the water from the tea bags into the tea. Allow to cool. Try to avoid cooling your tea concentrate in the fridge as it may become cloudy. 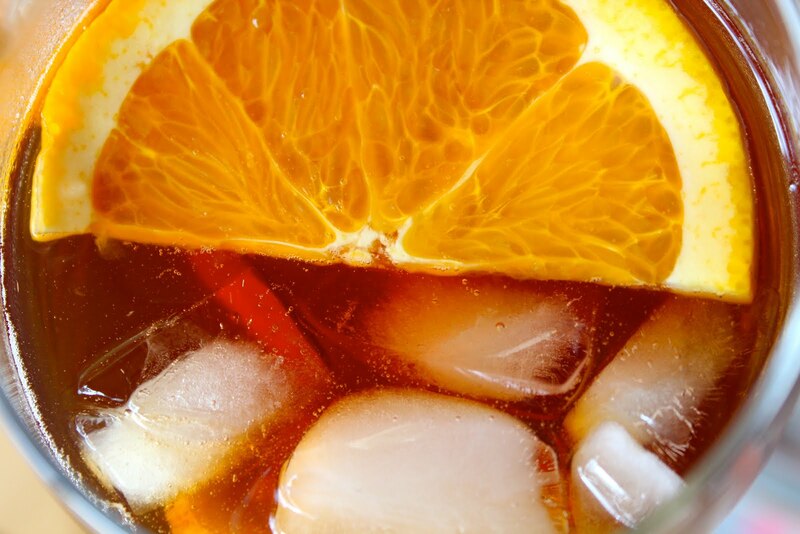 Pour in one part of your cooled iced tea concentrate to two parts chilled clean drinking water. Add a generous squeeze of fresh lemon to each glass you pour and enjoy your sweet iced citrus tea as the ice gently clinks and tiny beads of condensation trickle down the side of your glass.